I love those bright lights and country music. After a FAR less than successful house hunt day in Nashville, there was no better therapy than being surrounded by thousands of the highest quality rednecks, including my family, at the Grand Ole Opry. Did you know the Grand Ole Opry held this many people? Neither did I. Did you know this many people WANTED to be at the Grand Ole Opry at the same time? Neither did I. We saw some great performances, and some awesome fashion statements. Let’s start with the great performances. Dierks Bentley. He was good. Real good. And my sister Tatum? We are as genetically polar at two siblings can be, but there is this one area that we are quite similar….. The truth of this video is that Tatum was doing that for 1-2 minutes BEFORE I stopped laughing enough to pull my camera out and video. She’s just a dancer. And a big fan of Dierks Bentley. And is always wanting to be a star on this here blog. 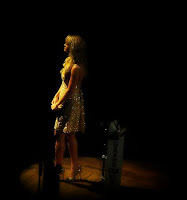 The highlight of the night was seeing cute Carrie Underwood get inducted into the Grand Ole Opry. She was humble and sweet and sang her little heart out. Here she is watching her highlight video that they showed before inducting her. Then Garth Brooks came out and gave her the trophy. Which was cool as crap. Vince Gill was absolutely blue grass spectacular. And I never expected to create that term. Now….. drum roll please….. let us take a few moments on this Mother’s Day to celebrate Country Music fashion at it’s finest. Marty Stuart. Country flavored ascot? Dreams do come true, people. Let this be your proof. Mustaches as thick as a chocolate Chick-fil-A milkshake? Same shade but more beautifully groomed? Aaron Tippin, you had me at hairy lip. And the pinnacle, dare I say the most fashion forward experience of my night…..
Turquoise boots. Or as Corporate H says, TURQWUAZE. Or as I say, THE HEAVENLY SHADE OF SHOE. Yes, these shoes made me want to live in this city MORE. Not less. If only I could find a house to live in. 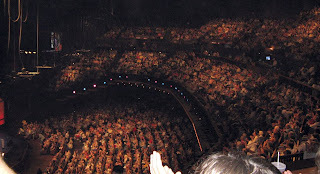 Hey Grand Ole Opry, do you rent seats out by the month?